Model based on advanced synchronized technology. Dependable high production performance with in-built safety factors for long term reliable operation. Less Floor Area – as immediate sealing of filed bottles. Accuracy depends on bottle size. Centralized Volume Adjustment System – no down time in volume settings. No container No Fill for Individual head & hence no spillages. 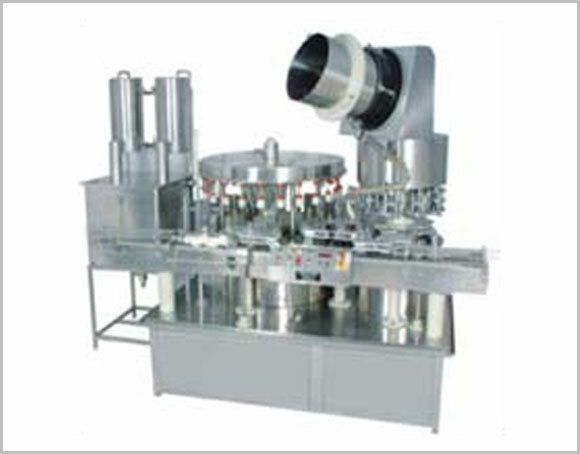 Cap Feeder settled main head which is suitable for operating. Sensor for no cap in chute – Machine stops. Better finish polished, S.S. 304 sheer used. Synchronize conveyor drive which is automatically suit with machine speed. Electronic budge indicate liquid level in vacuum tank if overflow additional sensor – provided on Cap Chute to avoid damage of caps during rotation. All the content part from S.S. 316 material. Machine speed control by AC varies Speed Drive system.